Hello, hello! Sorry for the relative silence over the past few days; I’ve been travelling for business and haven’t had great access to secure wi-fi. Today I want to share a set of Aesthetic Movement dessert plates I picked up a couple of years ago. 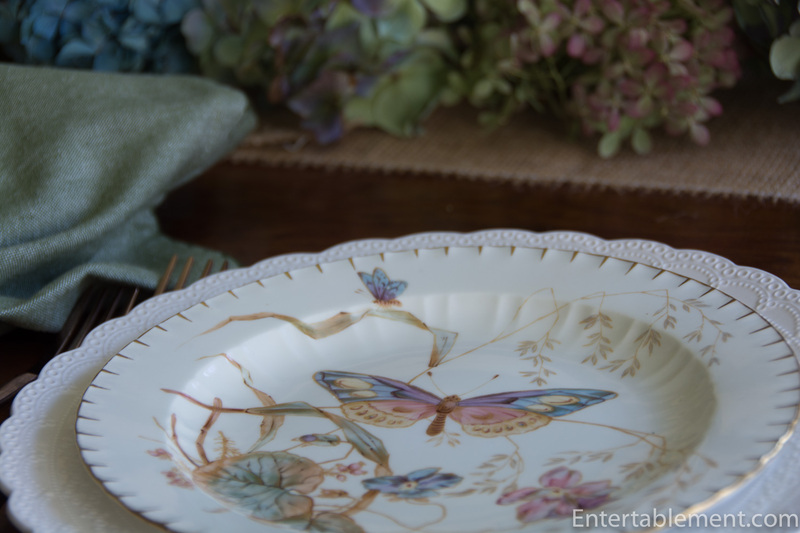 Soft pastel botanicals on a creamy background, with exquisitely detailed butterflies will always catch my attention. The gilt blanket stitch edging was the pièce de résistance. The plates were made in England c. 1889, and exemplify the Aesthetic Movement – Art for Art’s sake, rather than making a political statement. Apparently this need to have some relief from political wrangling is not new! 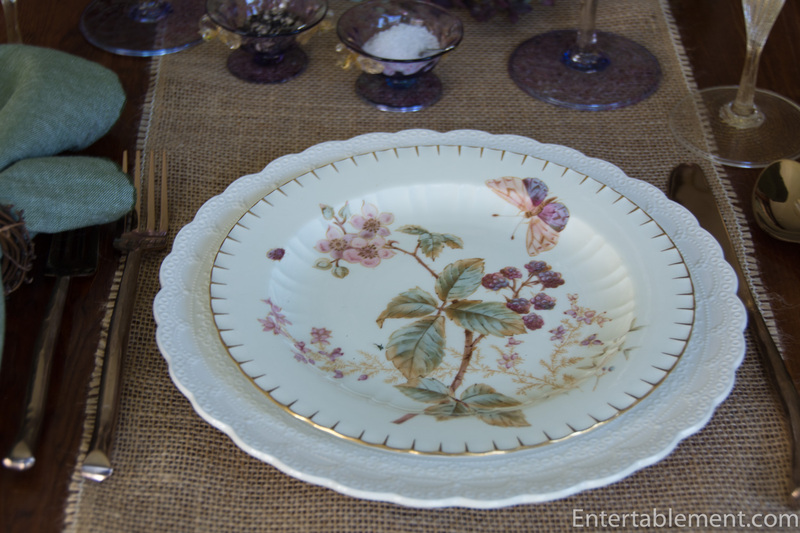 The background of the dessert plates is ivory and they’re almost 9″ in diameter, so they need a generously sized dinner plate to frame them. 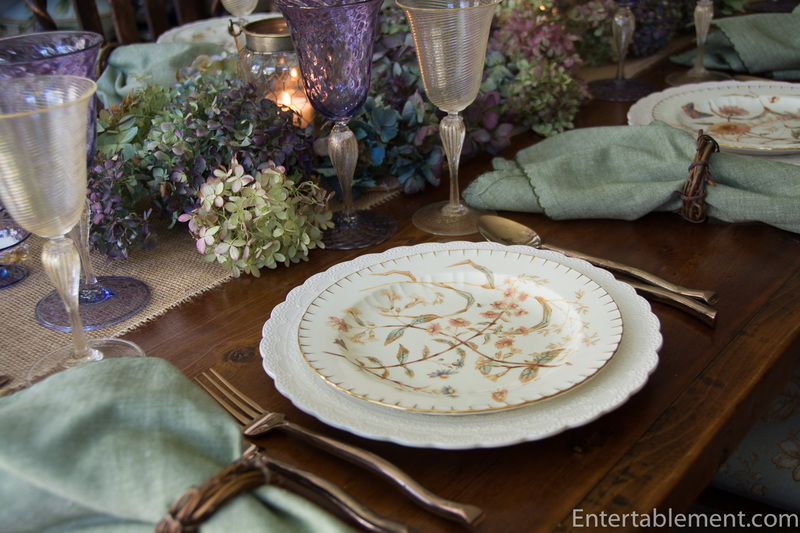 The creamy Jewel dinner plates did the trick nicely. I liked the contrast in textures against the similarity of the cream colour. Jewel was produced by Spode from 1926 to 1975; you can still pick it up on eBay sometimes, and Replacements is another great source. 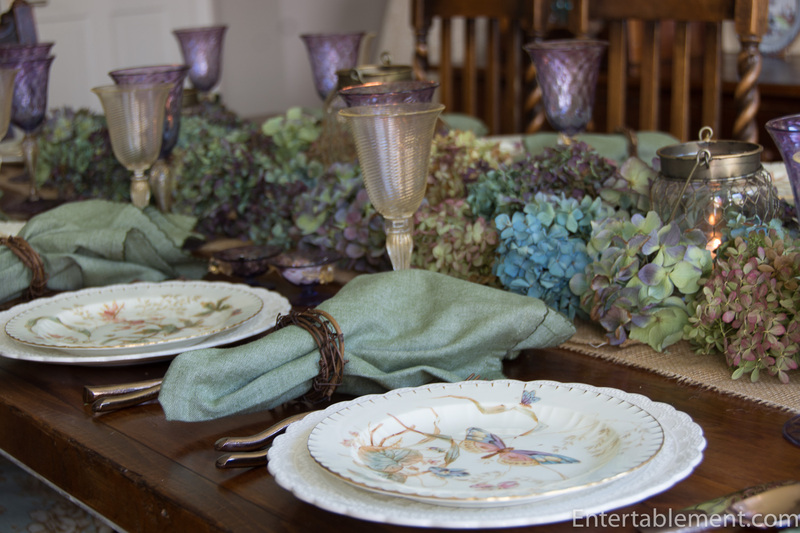 Dried hydrangea from last season picked up the soft purples, roses and greens. It was a messy centrepiece (the cats were thrilled), but also ready to hand. Sometimes you just don’t feel like schlepping to the grocery store to find fresh flowers! 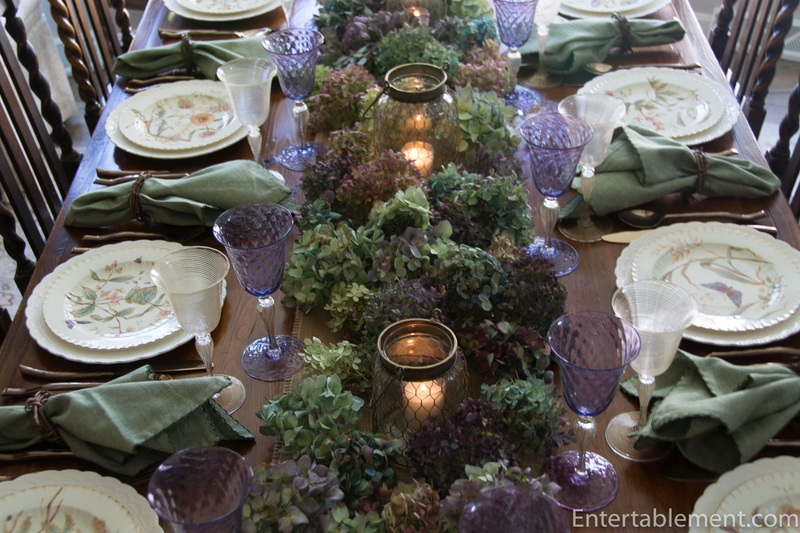 I anchored the table with a burlap runner, added lanterns covered in chicken wire in bronzy tones, then went to town with dried mop head hydrangea. I keep a few garden trugs full of them in the garage over the winter. They always come in handy! 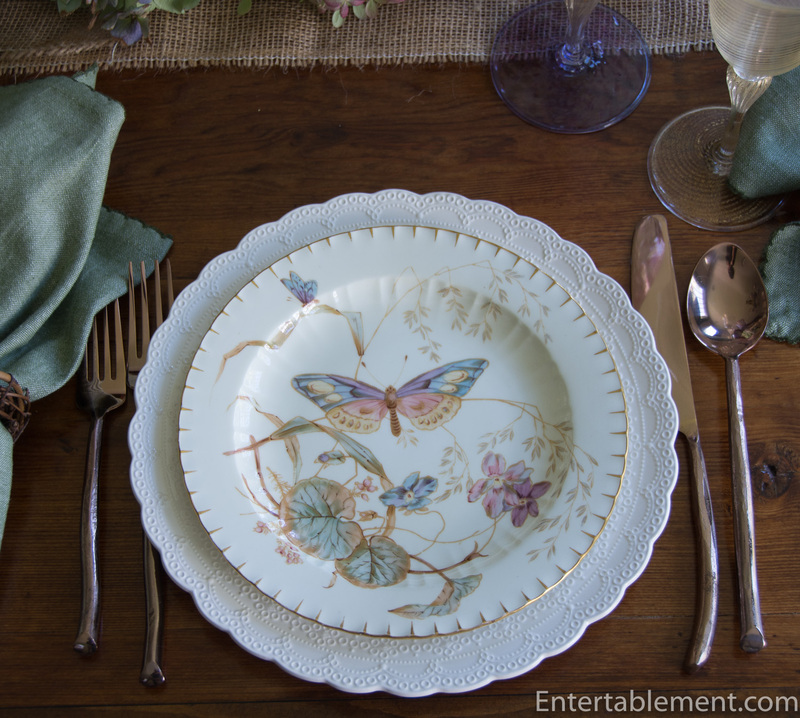 The cutlery is Twig by World Market in Rose Gold. 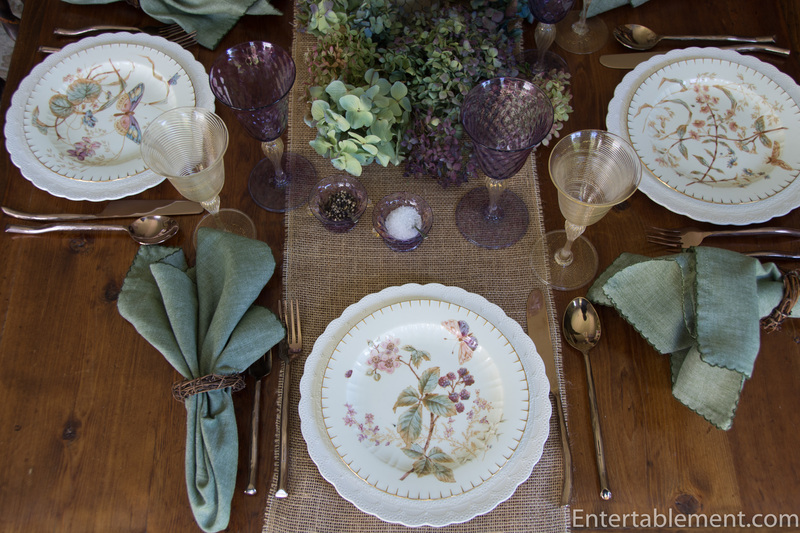 The napkins are Chambray Green by Pier 1; I liked the way the blanket stitch edge coordinated with the border on the dessert plates. 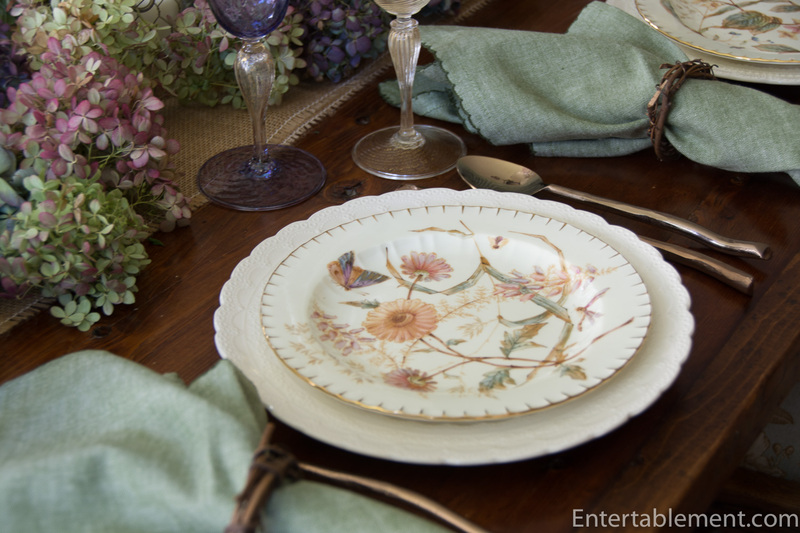 Grapevine napkin rings seemed the ideal accompaniment to a nature-inspired table. 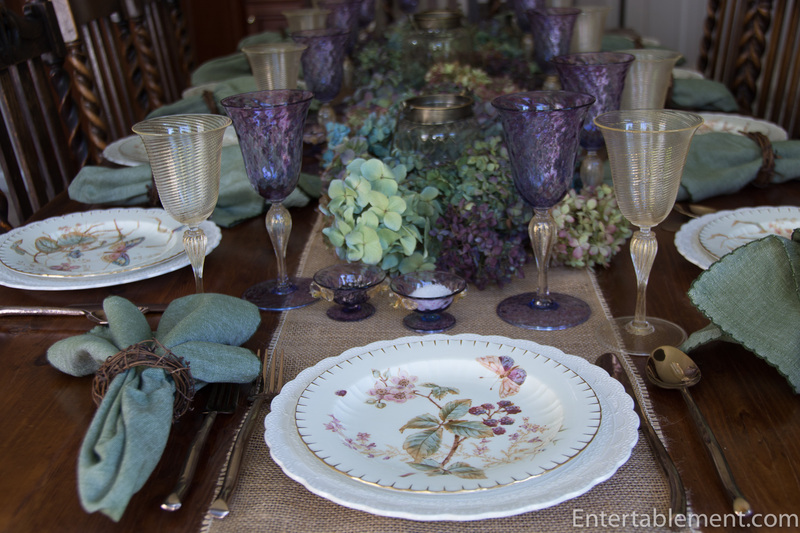 The plates came from Elise Abrams Antiques, as did the Venetian goblets in Amethyst and gold swirl. 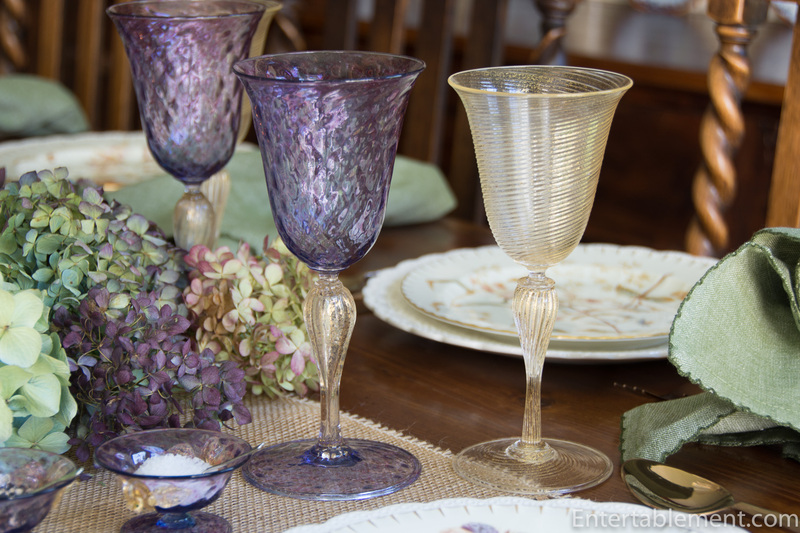 The open salts are from the same set as the Amethyst Venetian goblets. They always make me smile. 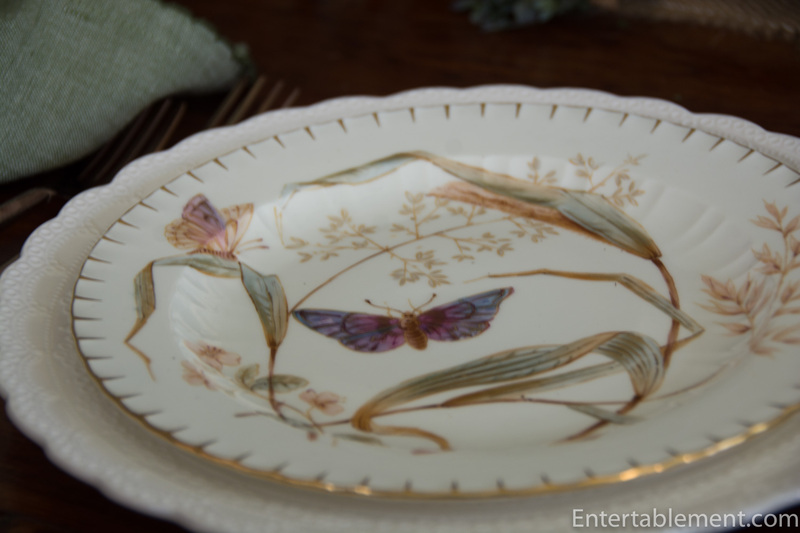 The butterflies are particularly prominent on a couple of the plates. Other plates are entirely flowers. And this one has a bit of both; aren’t the peachy tones of that Gerbera daisy just luscious? I managed to get ten of the twelve plates on the table, then hung precariously over it to snap the shot. Ok – now to get it all taken down before the cats make a complete hash of the house. Enjoy the weekend, everyone! Back to your decorating on the cape? 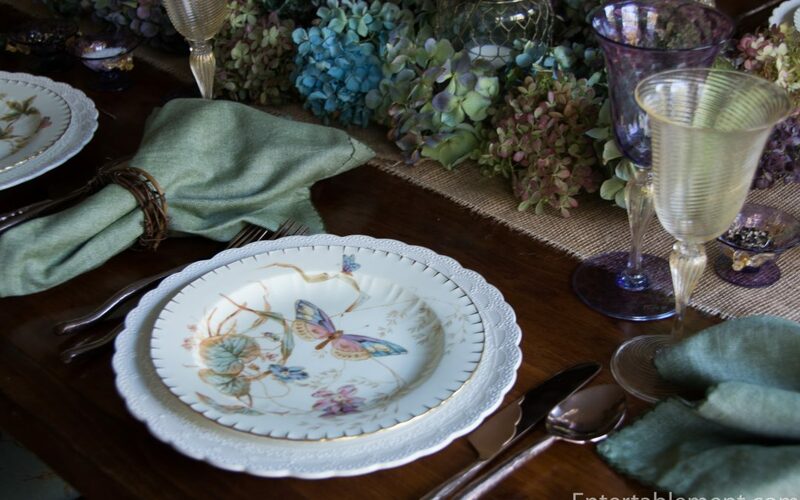 These plates are much to pretty to hide with food but look beautiful with your colourful additions of dried hydrangeas to match the plates and the amethyst goblets. 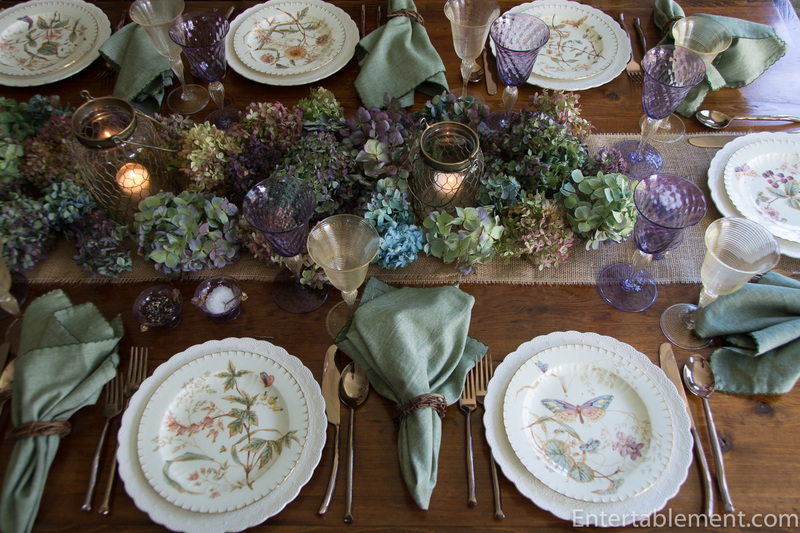 The napkins also blend beautifully with the plates and hydrangeas. A pure work of art!. I’ll have to do a better job of drying my hydrangeas and I don’t have any cats to mess them up. C U soon. I think we have all been waiting for this peaceful table. How comforting the range of hydrangea hues. 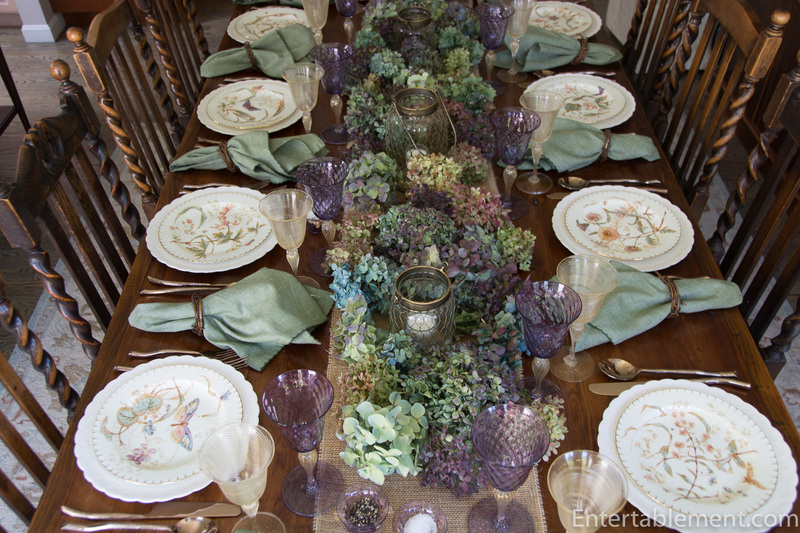 Like dining in a garden ! I hear a little pachelbel….. If we can’t have sunshine, let’s have peaceful. Pachelbel indeed. Canon in D? What lovely plates. Yesterday I made an ‘unplanned’ purchase of a heavy oval glass vase with etched butterflies. Hockey night in Cape Cod sounds much like Cowgirls and Indians running through the house at top speed, only to reverse in 30 seconds. I always think unplanned purchases have a special something about them. Your glass vase sounds wonderful – and with summer coming it will no doubt see a lot of action. And yes, you clearly know cats. They do turn on a dime and hurtle back in the opposite direction, scattering everything in their wake. Our smallest one, Ronnie, is about 4 lbs in weight and the noise she makes is not to be believed. The word that comes to mind is ‘serene’. And lovely, of course. The coordinating blanket stitches are charming. Thanks, Sandra. It is a very peaceful design – you’re right. Probably the muted colours? Lovely of you to stop by. Enjoy the weekend. Lots of interesting things on this table. 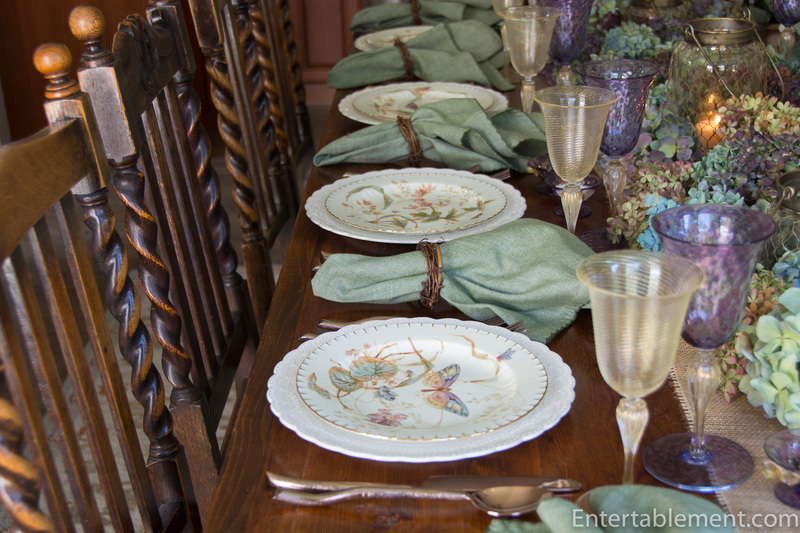 I love the texture of the napkins and the look of stitching on the end of the salad plates. The glasses are lovely and I like how the shapes are the same with the colors being different. Very nice. Thank you, Lorri. I really like the stitching edge of the plates, too. It struck me as quite unusual, and made the overall design more casual and approachable, I thought. I hope all is well in your world!